Announcer: We Earthlings do not have the total recall of a Time Lord. Part Two of... "The Time Monster." Jo: Doctor, are you all right? Doctor: Ohh... oh, I must have been dreaming. Jo: I'll say you were! A real pippin of a dream! Master: A simple piece of quartz, nothing more. Ingram: But Professor Thascalus, that is ridiculous! Master: Of course it is, Dr. Ingram, of course it is! You know, there is no means by which I could prove to you that that crystal is different from any other piece of quartz. And yet, it is unique. 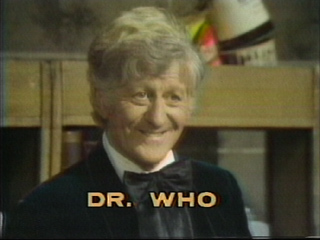 Jo: Doctor... it's the Brigadier. Doctor: Hello, Brigadier? It's the Doctor here. Now listen to me. I want you to put out a worldwide warning. Alert all your precious UNIT HQ's. Not that it'll do any good. Brigadier: Thank you very much. And against what, precisely, am I supposed to be warning the world? Doctor: The Master. I've just seen him. Brigadier: Seen him? Where? When? Doctor: Uh, in a dream. (pause) Not half an hour ago! Master: Come here. Closer. Now look into my eyes. There is nothing to worry about. Everything will be all right if you just obey me. Just obey me. Cook: Obey. I must obey. Everything will be all right. Doctor: The Crystal of Kronos! So I amright! Ingram: Kronos? Well, that's what Stuart said! But Doctor, what is all this about? Doctor: Well... it'll be difficult to accept, I warn you. Doctor: Well, luckily, you are already familiar with the concept of stepping outside of space-time. Ingram: I've lived with the concept for months. Doctor: And I've lived with it for many long years. I've been there. Doctor: Yes, I have. Strange place it is, too. Place that is no place. Dangerous place where... creatures live beyond your wildest imagination. Chronovores! Time-eaters! Who can swallow a life as quickly as a boa constrictor can swallow a rabbit... fur and all! Ingram: Are you saying that... Kronos is one of these creatures? Doctor: I am. The most fearsome of the lot! Jo: It's all right, it's all right, you're quite safe. Stuart: Nobody's safe! No one's safe! Oh! He's here! He's... he's here! I saw him! Ingram: Oh, the poor boy's delirious! Don't try to speak, Stuart, just rest. Doctor: No, let him talk. Who did you see, Stuart? Answer me! Ingram: Please, stop [can't make it out], please! Doctor: Look, Stuart, who did you see? Doctor: Be quiet, both of you! Now, answer me! Who did you see? Answer me! Stuart: Kr... Kr... Kr... Kronos! Neophyte: Holiness! Holiness! Come quickly, the crystal is afire! Krasis: At last! At last, Kronos, the time is come! And I await your call! Krasis: I am Krasis, high priest of the temple of Poseidon in Atlantis! Master: Poseidon? But surely Kronos is your lord! Krasis: You would dare profane with your irreverant tongue the great secret? The mystery which no man dare speak? Who are you? Master: I am the Master... Lord of Time, and ruler of Kronos. Krasis: You lie! No one rules Kronos! Master: I shall, with your help! Master: And together we shall become masters of the universe!